Canon G12. Edited in Lighroom 5, Color Efex Pro and Nik Silver Efex Pro (Antique Plate II). Patapsco Valley State Park. LOVE this image, Emily, I’ve been pinning doors and windows all day on Pinterest. Hmmm…. that fascination with doors and pathways continues! 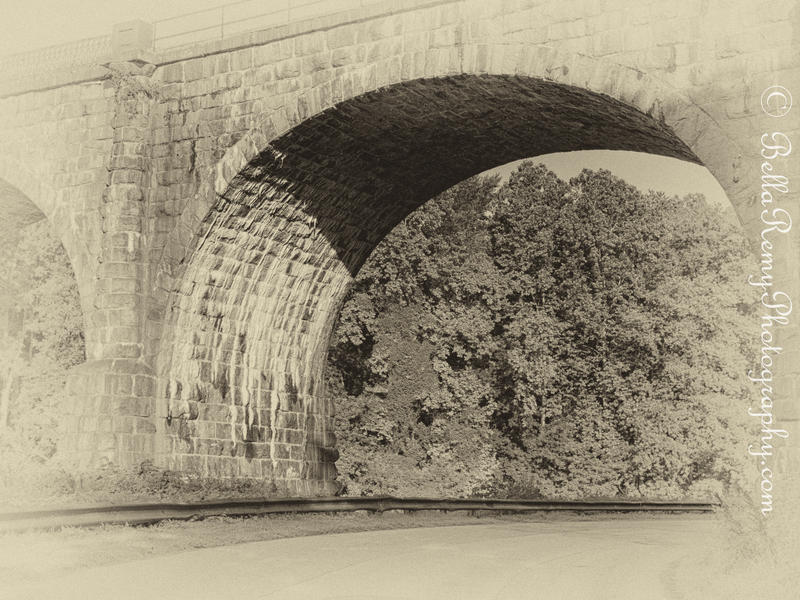 I love the soft vintage processing and how well the curve of the tunnel is captured. I love the vintage look of your photo and the sentiment is quite perfect. Hi Charlie ! How are you ?? Funny, I was just thinking of you the other day. I hope all is well with you. 🙂 Thank you for your kind comment. Well then, it must be that my mirrors think old, and that they’re lying to me when they show my hair grey and beard white. Thank you so much Drake ! Appreciate your kindness. Love this – perfect match of image and words! Your treatment of the photo is awesome. Beautiful in B&W, especially the angle – expansive view from under the overpass. I love this viaduct. I could photograph it every day. One time I’ll see if I can get up on the top of it. Now that would be fun. Terrific! Looks like an old time exhibit or cabinet card. I haven’t heard of “The Railway Children.” I definitely will look that up as just the title sounds very interesting. This area has so much railroad history because of the B&O railroad line. Thank you so much for your kind comment. Oh..interesting. Thanks for the info. I’ll definitely try to find it. Sounds like a great vacation movie too.